Practically the first thing we did upon deciding on Hawaii as our honeymoon destination was make a reservation at Alan Wong’s in Honolulu. Our excitement to eat at this relatively unknown restaurant was fueled by strong rec’s from friends and co-workers (including a Hawaiian native) and reinforced by Alan’s appearance at the finale of last season’s Top Chef. Our expectations were high, and we were not disappointed. To start off a super fresh and delicious river oyster was served with ice shavings and a chili sauce. 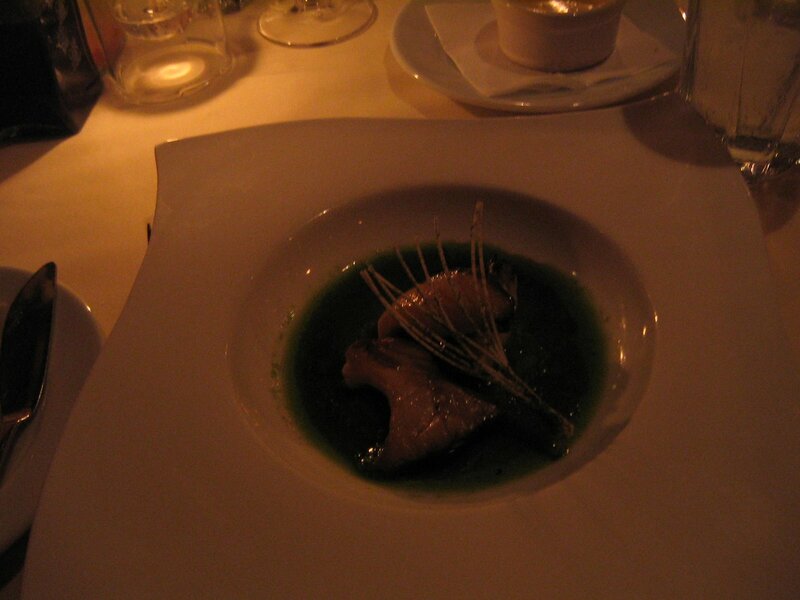 This very refreshing and appetizing amuse bouche served its function well. We were ready to eat some good food. First course was an interesting play on the classic soup and sandwich combo featuring a pig, foie gras and mozzarella sandwich suspended over a martini glass of fresh tomato soup by a parmesan wafer. The presentation turned heads of fellow diners and was very tasty. The “Voove” was the perfect companion with its cool, crispness offsetting the warm and creamy soup nicely. Then some foie gras with chutney. Pretty standard nice restaurant fare. Third course was Christi’s favorite. It was an egg and tofu flan, garnished with edamame and small shrimps. The consistency of the flan was good and overall the flavors worked well together. My only complaint was the portion was a little on the small side. Not really an issue considering the amount of food served overall. Not a huge fish eater I was surprised to find that the next course would be my favorite of the evening. Fourth was a couple pieces of pan fried red snapper in a tasty sauce. Can’t remember all the details but do know I liked it a lot. The abalone came next. Christi and I never really had abalone before and weren’t sure what to expect. Turns out it is pretty rubbery and doesn’t seem to have a whole lot of natural flavor. Unfortunately the mushroom and oil sauce paired with it didn’t do much to bring some out. This was probably our least favorite portion of the meal. Last up before dessert was a very nice piece of well prepared striploin, lined up with some potato salad and yet more foie gras. 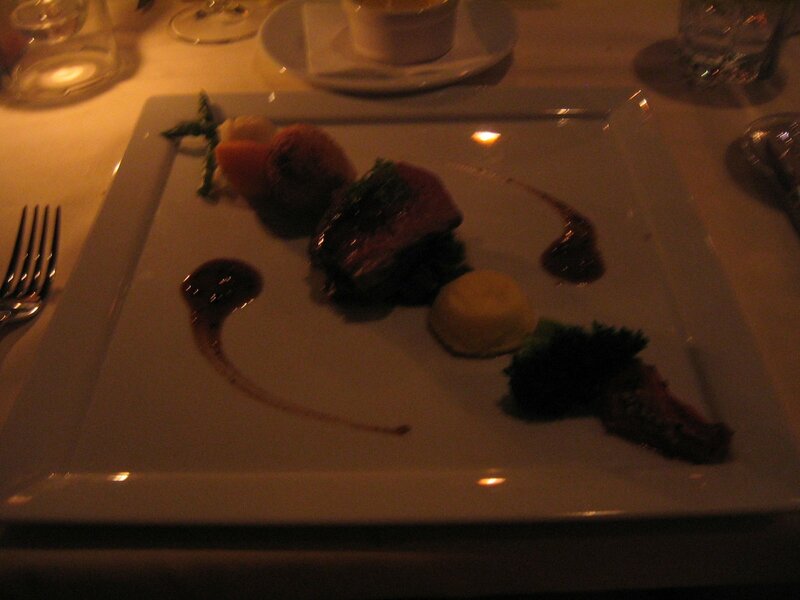 Again the presentation was very nice and overall it felt like a good conclusion to the hearty part of the meal. The dessert sampler served was a crippling (filling) array of little sweet numbers that we ate while enjoying some freshly pressed Kona coffee. Overall, all 7 courses were superbly presented and consistently very tasty. It easily ranks with all the New York and San Francisco establishments we’ve collectively been to. In fact Christi, perhaps boldly, ranked this experience higher than the one at The French Laundry. So, if you ever are fortunate enough to find yourself in Honolulu I highly recommend enjoying a meal at this truly outstanding establishment. This entry was posted on June 8, 2007 at 11:26 pm and is filed under *Mike and Christi, Hawaii, Restaurant. You can follow any responses to this entry through the RSS 2.0 feed. You can leave a response, or trackback from your own site. OMG DROOL.. fantastic report! the abalone is gorgeous! i love abalone, i love the rubberiness. good to see you ate so well during your lovefest (although i didn’t expect anything less from you two), and Christi, I’m glad you called French Laundry out exactly as it should be!!! 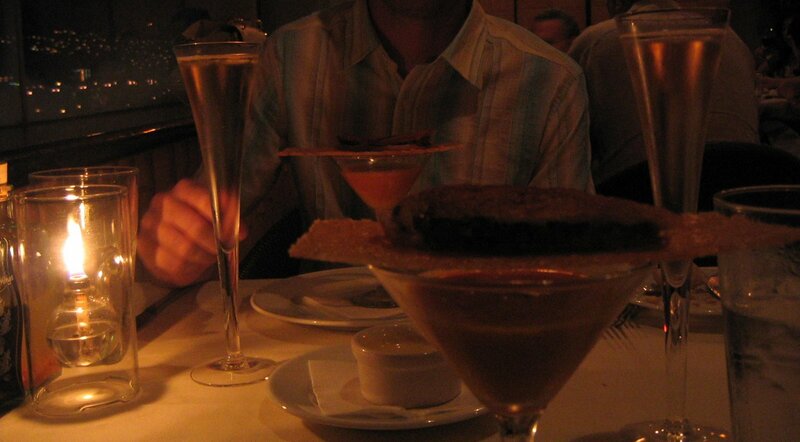 Bring on the foie gras!